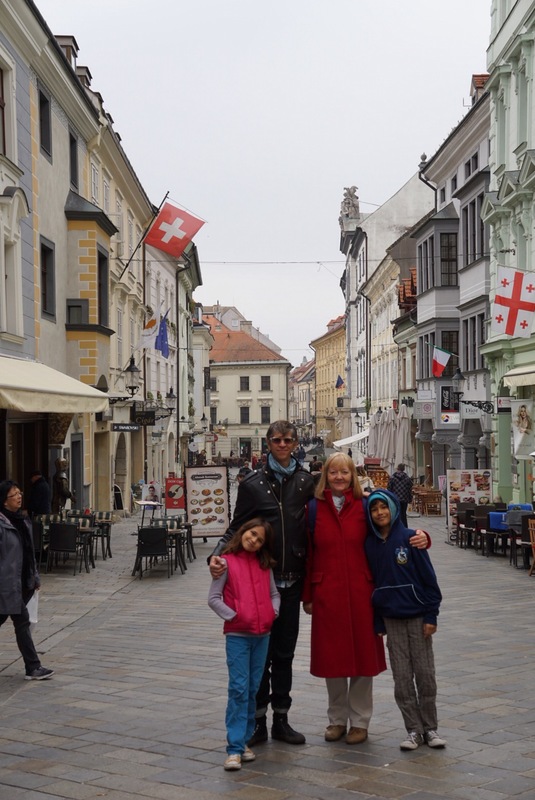 Eric did a moving write up about our family in Slovakia and how wonderful it was to meet them. They greeted us like we were close friends who they hadn’t seen in a while, not like people whom they hadn’t before met. I’m still blown away by how welcoming and generous they all were to us and hope that we are able to reciprocate in the future. 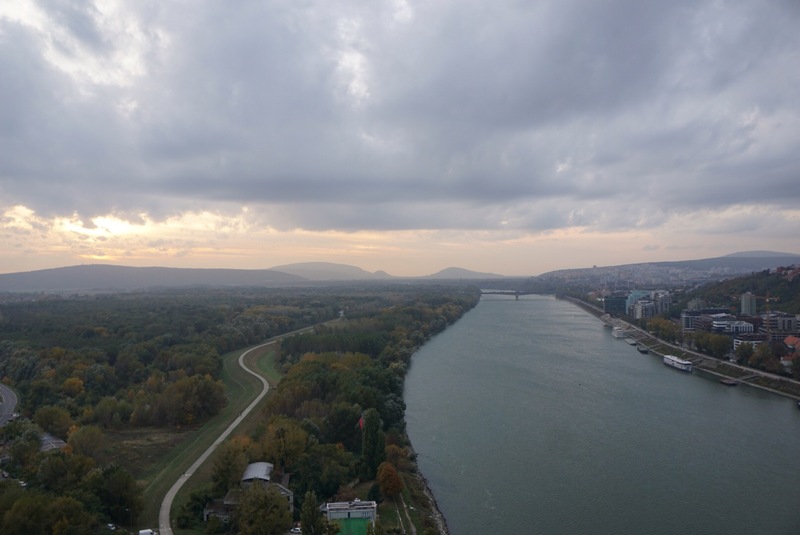 I would like to write a bit about Bratislava itself though, to keep up with the travelogueing. Before I get into the time there, though, I feel I must go back and tell you about our Romanian taxi driver who got us to our car rental agency. All four of us had walked out of the flat early morning of our departure, hoping to find an easy taxi. None seemed to drive by so we walked over to the nearby grocery store, where you can usually find a waiting taxi, but not today. Just as we were contemplating walking over to the mall taxi stand instead, one drives up. Eric walks over and asks if he is free, and he burbles back to us in Romanian that he is here on a call and that if you wish for a taxi you must call one. Dismayed, we started to walk off but he signaled us back and told us to wait for a moment as he would call a cab for us. “How nice!” we thought. When his customer came over, holding a bag of groceries, she got in the back of the cab and I expected they would take off. Instead, he began to chatter with her in rapid Romanian which I could hear through his open window, and she then proceeded to get out of the back, get into the front seat, and then he opened the trunk and gestured for all four of us to squeeze in the back. Apparently, the plan was now that he’d drop the woman off at her place and then take us since it was kind of on the way. The girl squeezed onto my lap and off we went. Eric soon switched into the front seat and for the rest of the ride, in broken Romanian and English helped along with Google translate, we had a fun ride and a conversation, focused on the kids, life in Romania. At one point he looked at us and asked, “George Bush?” To which we gave a horrified “No nononono!”response . Along the way his phone rang and he had a short conversation in Romanian, though we could make out the words “America!” and “Obama!”amongst the palaver. 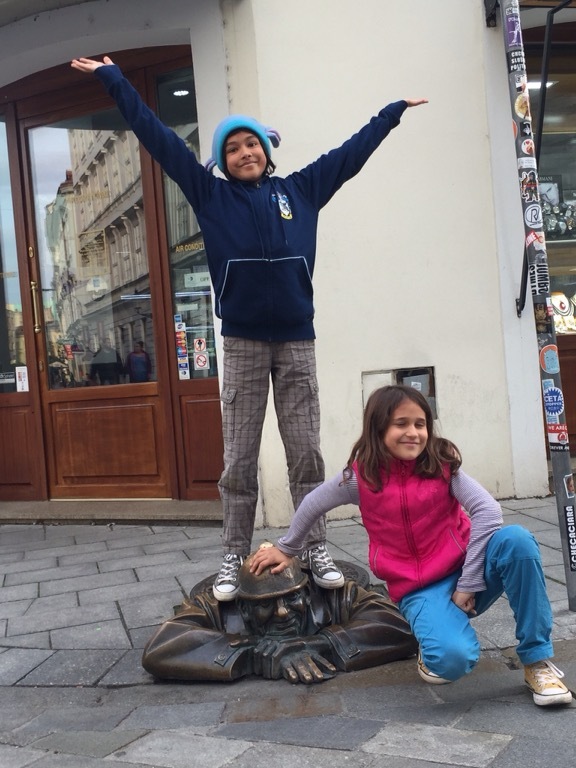 When we told him that the kids liked Romania, he answered “super! 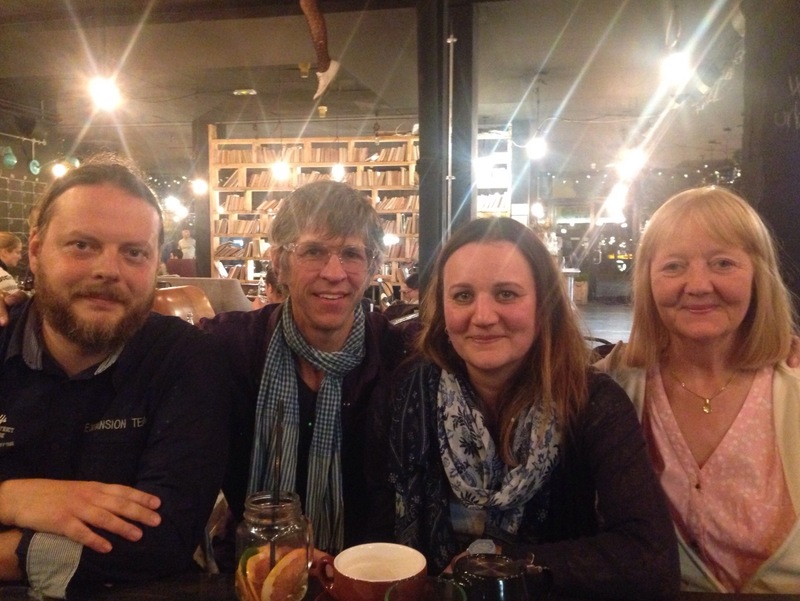 !” in such a sweet way (pronounced “su-PEAR!”), genuinely delighted that our family was enjoying his country. All this to show one example of the great interactions we have had here. Alright, back to Slovakia! We drove across Hungary to get to Slovakia, and I mused that it no longer seems strange to just drive across an entire country in one day. It was about 5 hours of driving, which barely gets you out of most states back home. Eric’s relative Eva lives in Nitra, which is a bit outside Bratislava, the main city and capital of Slovakia. A pretty small European town, the only real sightseeing we did there was to see the castle, interesting chiefly for its opulent cathedral, touted as one of the oldest in Europe. It really is stunning inside, though I have to admit that sometimes cathedral interiors feel a bit overdone to me. 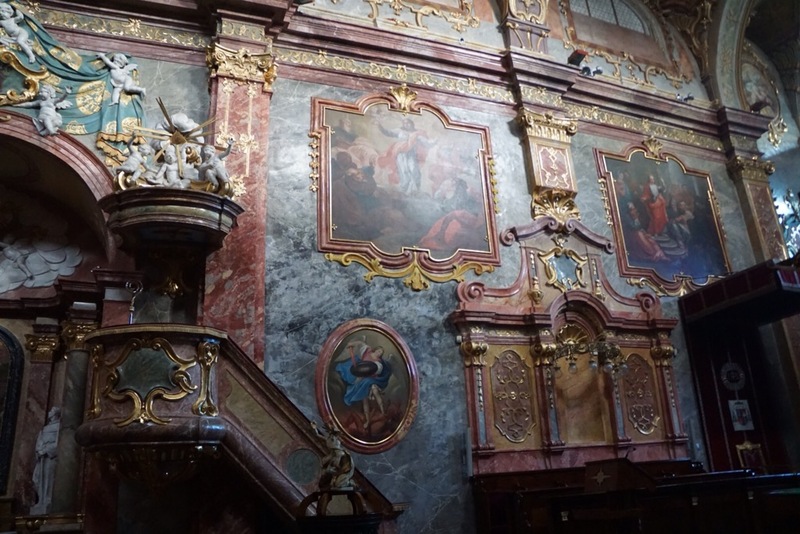 Everything shines about in gilded facades and every surface is painted with saintly scenes, sometimes it can be visually overwhelming, like a bad “after” from an episode of Trading Spaces. 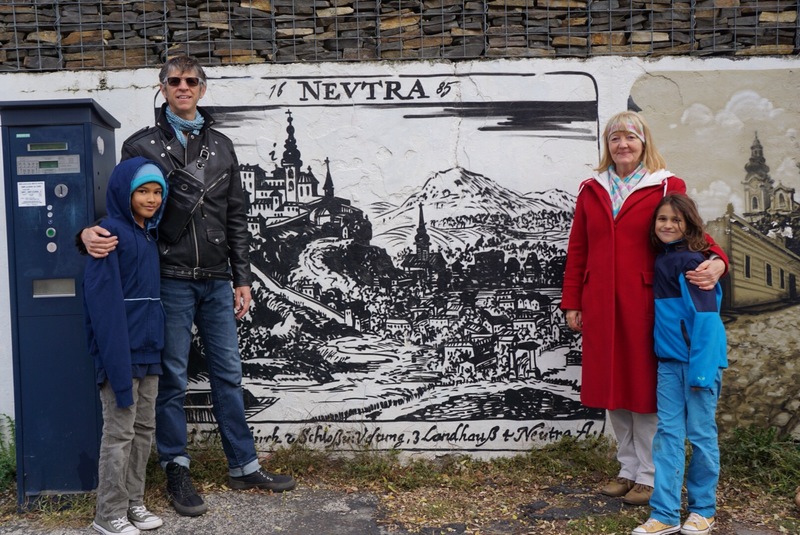 We made it to Bratislava in the evening and met up with Denisa and Edmund, Eva’s daughter and son-in-law, or Eric’s third cousin. I looked up a chart of those weird relationship things and discovered that Eva is technically a second cousin twice removed! I’ve always wanted to say that and now I can! Eva had gone through some trouble to find us the perfect flat in the middle of Old Town Bratislava, so we were well situated. Side note: I really much prefer the old name of Posovny. Bratislava just sounds so…brutal…and like the name of a country, not a city. Posovny is so much more romantic! Perhaps the civic leaders will take heed of my blog and take the appropriate steps. Old town Bratislava is lovely, with narrow pathways through old stone buildings. 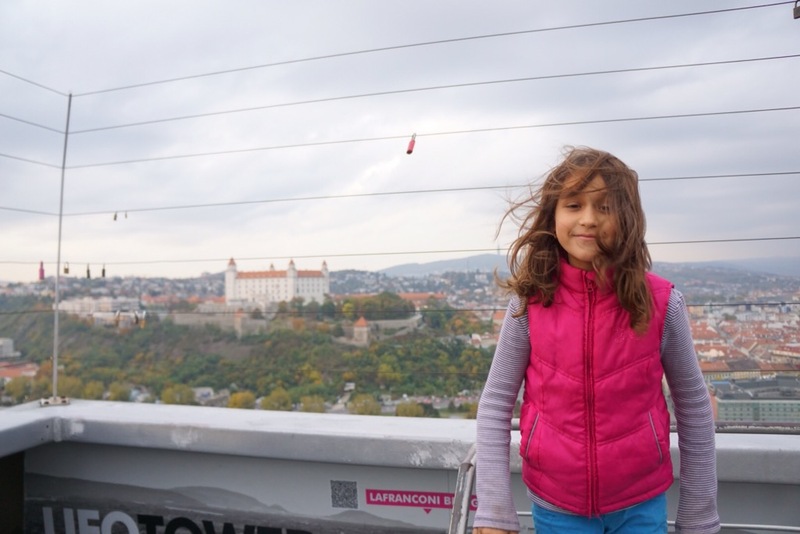 Once you leave the picturesque old town area, though, Bratislava reverts into a fairly typical landscape of paved streets and commercial buildings, so we scurried back to old town as quickly as we could. We rounded a corner and stopped to see a man coming out of a sewer grate! 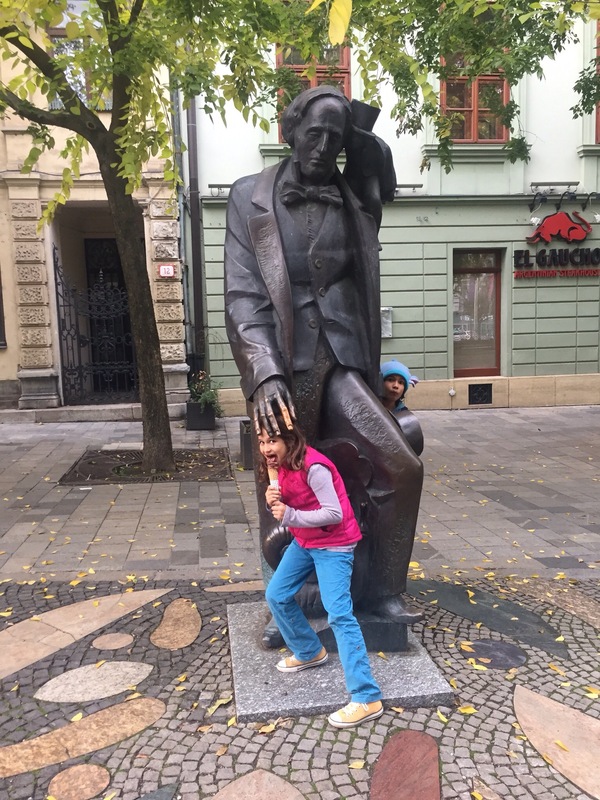 The tourists posing with him were a bit curious, until we got close enough to see that it was a statue! 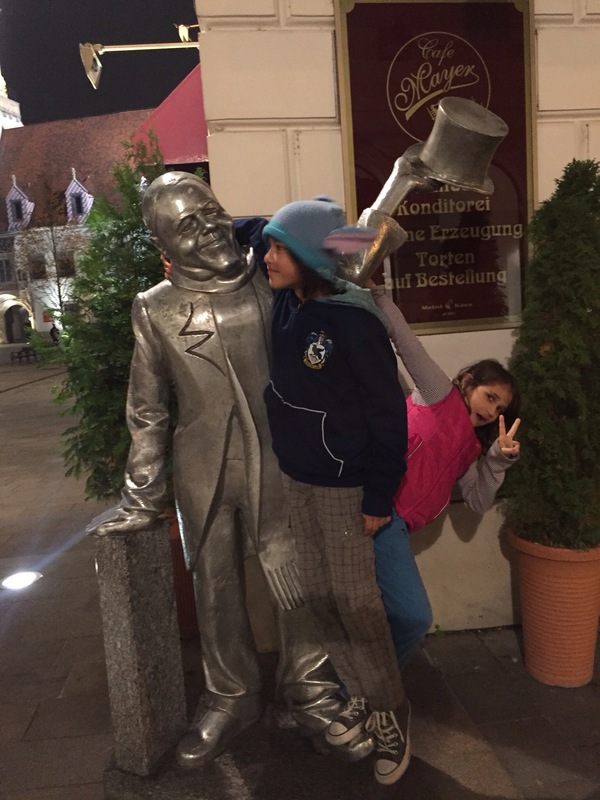 There are several such statues around the old town area and we made good fools of ourselves for pictures like everyone else. That evening Eric’s cousins treated us to the UFO, a saucer like structure on top of a bridge pylon, which overlooks the entire city & Danube river. We wandered about on the top deck, open to the elements and looked over the view. The kids played about on a set of stairs, which made me a bit nervous given that we were, oh, 300 feet above the water. Afterwards we went into the thankfully enclosed space below and had a cocktail and cheerful conversation with our new cousins, watching the sun set over Bratislava. 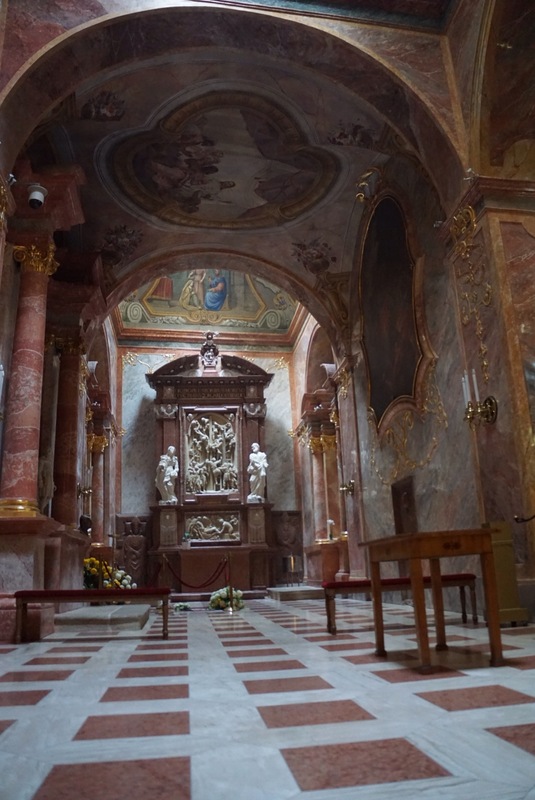 In which we learn to say, “Ah, Vienna!” Like everyone else. Thank you for this blog about my families country.will read it many times.